Perfect for recording temperature in trucks or warehouses, SwiTrace Cold Chain Solutions are easy to use and provide vendors and inspectors with a complete temperature history of your product. Their built-in USB interfaces make it easy for drivers to connect them to a PC for data download. Starting at just $29 each, these low-cost transit data loggers are available now–call a CAS Applications Engineer at (800) 956-4437 or request more information. To help prove your product quality and best practices, we can provide your business with the New SwiTrace I-Plug PDF Temperature Data Loggers. Placed among product palettes in truck shipments, these cold chain data loggers automatically generate PDF temperature reports containing a full temperature history to give to receivers. • Self-generates a full PDF temperature report once connected to a PC! • Send and store data to the Web with just a click! The I-Plug PDF temperature data logger monitors the temperature of its environment at a wide range of -40°C to +65°C (-40°F to 149°F). 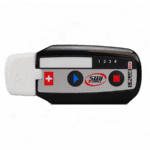 With an encrypted 8,000-point memory capacity and a 1-year lithium battery, the data logger is ideal for extended trips to vendors. The new I-Plug IPST8 Temperature Data Logger is a single-use version of the I-Plug which continually monitors your product whether in storage or transit. Its built-in USB interface makes connection to a PC a snap for downloading data. 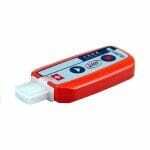 *Note: The IPST8 Single-Use Logger is orderable in quantities of ten. The new multi-use I-Plug IPMT8 Temperature Data Logger is a great temperature monitoring solution for in-transit cold chain applications. Lasting over several trips to vendors, this reliable and compact device gives vendors proof of your best practices and product quality via PDF temperature histories. The I-Plug’s High and Low Alarm LEDs show if there has been a temperature excursion at any point in the trip. Users can select alarm settings and set the temperature sampling rate, for example one reading every 10 minutes. Auto-pdf file generation means it’s easy for drivers to give full electronic temperature documentation to receivers. All it takes is quick connection to a PC via USB, and in minutes the vendor has electronic proof of your PQ and best practices! Using the SwiTrace Web Portal, it’s easy for users to enter the Serial # of their I-PLUG PDF and see if it has been downloaded yet by the receiver. If the receiver has already selected the ‘Send to the Web’ feature while reading the device, the user will get instant online access to the temperature report. 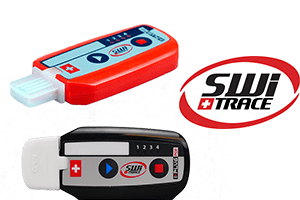 For more info on the SwiTrace Cold Chain Solutions, or to find the ideal solution for your application-specific needs, contact a CAS DataLoggers Application Specialist at (800) 956-4437 or request more information.